Food Quote – or at least a quote from a food person! Move. As far as you can, as much as you can. Across the ocean, or simply across the river. Walk in someone else’s shoes or at least eat their food. Open your mind, get off your couch, MOVE! I don’t know why I thought about short ribs the other night. I have never had them and they just popped into my head. I thought it would be a tasty protein to put on a pizza. 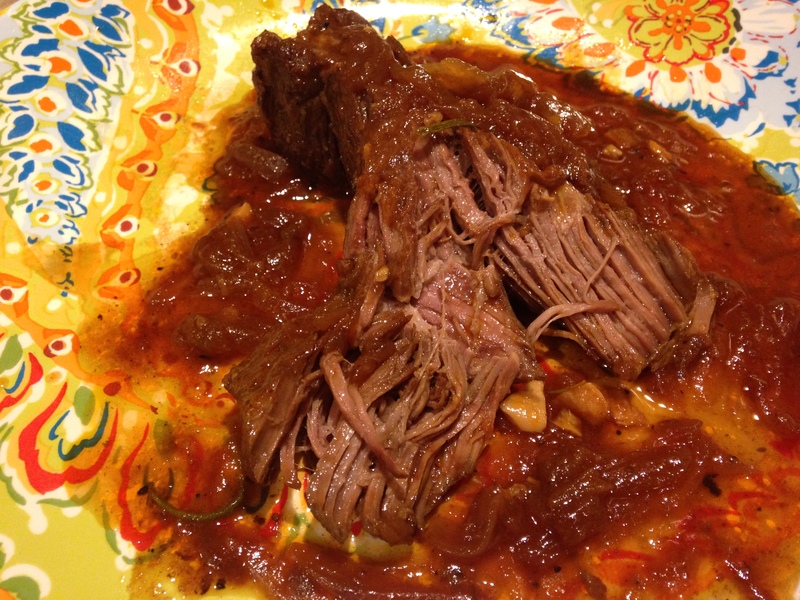 😉 I remembered hearing about braised short ribs and thought I would check for some recipe ideas online. As always, found the recipe I thought would work the best on America’s Test Kitchen (ATK). ( I changed this recipe up enough that I am posting what I did. Hope you don’t mind!) The ribs were moist and very flavorful. Since I didn’t really know what to do with the short ribs for a pizza I asked the crew. They suggested barbecue sauce, lots of red onions, red pepper, green pepper and fresh mushrooms (all sliced thin), with mozzarella cheese. It was DELICIOUS!! serve with mashed potatoes and veggie/salad OR on pizza!! 1. Adjust oven rack to lower-middle position and heat oven to 300 degrees. Pat beef dry with paper towels and season with 2 teaspoons salt and 1 teaspoon pepper. Heat 1 tablespoon oil in large heavy-bottomed Dutch oven over medium-high heat until smoking. Add half of beef and cook, without moving, until well browned, 4 to 6 minutes. Turn beef and continue to cook on second side until well browned, 4 to 6 minutes longer, reducing heat if fat begins to smoke. Transfer beef to medium bowl. Repeat with remaining tablespoon oil and meat. 2. Reduce heat to medium, add onions, and cook, stirring occasionally, until softened and beginning to brown, 12 to 15 minutes. (If onions begin to darken too quickly, add 1 to 2 tablespoons stock to pan.) Add tomato paste and cook, stirring constantly, until it browns on sides and bottom of pan, about 2 minutes. Add garlic and cook until aromatic, about 30 seconds. Increase heat to medium-high, add beef stock and simmer, scraping bottom of pan with wooden spoon to loosen browned bits, until reduced by half, 8 to 10 minutes. Add broth, carrots, and thyme. Add beef and any accumulated juices to pot; cover and bring to simmer. Transfer pot to oven and cook 2 to 3 hours. (I did 3 hours. I ended up running errands while the ribs were baking. Took a little longer that expected. That was a good thing!) Serve!! You could make a gravy with the sauce (or not) and serve with mashed potatoes and salad or veggie. The sauce was absolutely delicious. YUM! I used 2 ribs for my pizza. We are enjoying the leftovers. Kent had a sandwich and I had mine warmed up with the sauce and a salad. Next time I will make for a delicious Sunday meal. This really is a simple and delicious meal. Enjoy it!! This is a huge hit in our home. 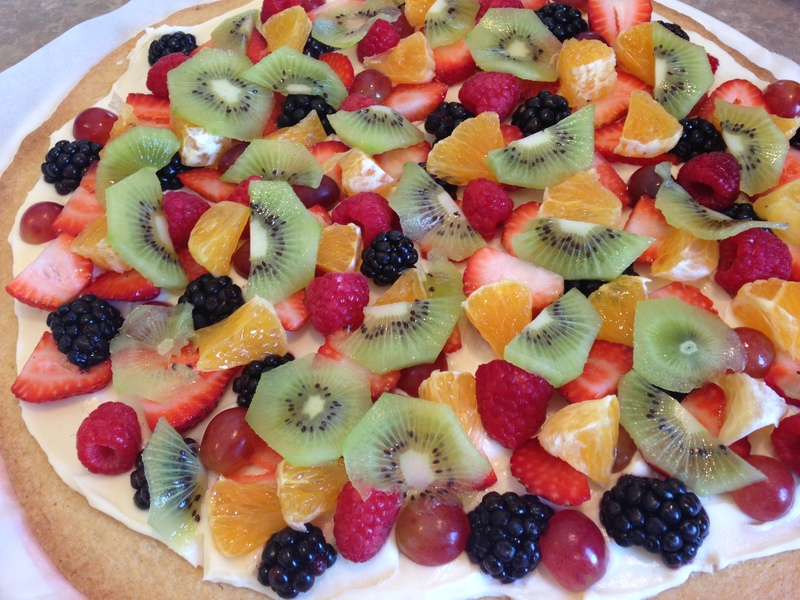 EVERYONE loves this dessert pizza. I have posted this recipe before but wanted to update. It’s that time of year with the farmer’s market and all. A simple and delicious recipe for you to share with your family. Enjoy! I was going for 4th of July but couldn’t resist more color!! You start with a sugar cookie dough. 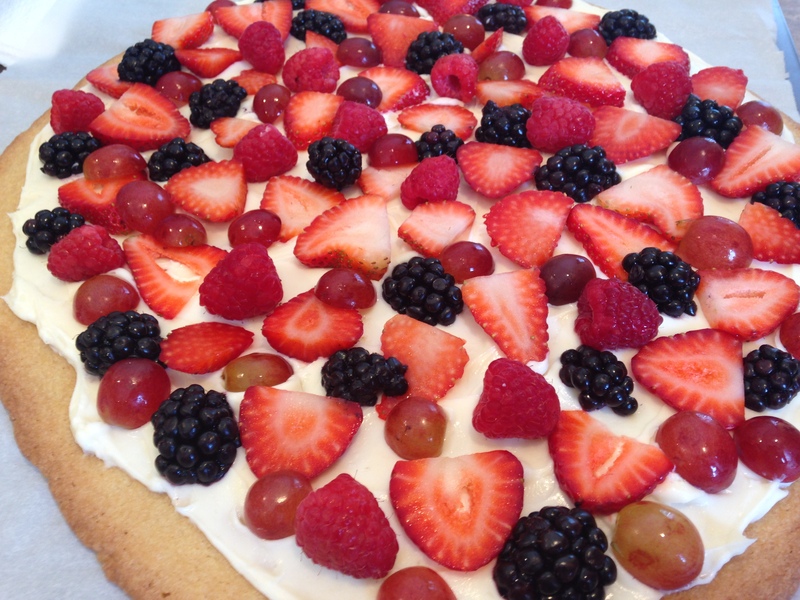 I happen to make my own and roll it out into a huge sugar cookie. You could also use a premade sugar cookie dough, too. 1. Preheat oven 375 degrees. Line a baking sheet with parchment paper (or spray with non stick cooking spray). I use parchment paper all the time. LOVE it! 2. Using stand up mixer (or you can do by hand or with electric mixer) cream butter, sugar and brown sugar at medium speed. Add egg and vanilla, beat at medium speed until combines. Add dry ingredients and beat at low speed until just combined, scraping down bowl as needed. 3. Take out dough and shape into a ball. Either by hand or using a rolling pin, roll or push out dough into a circular shape (like a pizza) until about 1/2 to 1/4 inch thick. I push out by hand then I top with a piece of wax paper and use the rolling pin to roll out to a 12-14 inch circular shape. 4. Rack should be in middle position. Place cookie sheet in oven and bake for 15-20 minutes. Edges will be golden brown. Remove from oven and set aside. Fresh strawberries (sliced), blueberries, blackberries, raspberries, grapes, bananas, kiwi, oranges. Whatever combination of fruit you desire. Mix the first three ingredients until well combined. When cookie dough is at room temperature, top with cream cheese mixture. Arrange your fruit on top as you desire. 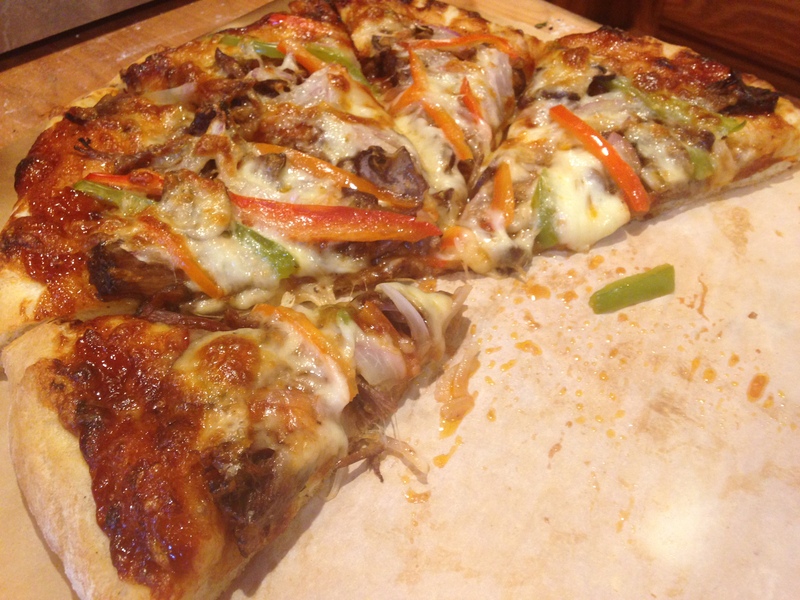 I guarantee you will not have any leftovers with this pizza! !